It's been a while since I've made a recipe from my Foodie To-Do List (over there on the right sidebar). My friend Anne had us over for dinner last week, and when I offered to bring something bready, these fun-looking came to mind. While my favorite pastime is still watching dough rise, making this recipe was fun for other reasons too. The rolling, slicing, stacking, and more slicing to achieve the multi-layer pull-apart effect was cathartic in a way only bread baking can be, and the addition of heaps of yogurt and olive oil made for a novel dough-working experience. Feel free to substitute other herbs for chives; I think rosemary would be particularly divine. 2. Stir the flour, salt, yogurt, chives, and 3/4 cup olive oil into the yeast mixture with a wooden spoon or the stand mixer paddle just until a soft dough forms. Switch to the dough hook and knead until the dough is smooth (or turn the dough out onto a well-floured surface and knead for about 10 minutes). The dough will still look and feel slightly shaggy from the oil; it won't have the perfectly smooth, taut feel of a more traditional yeast dough. 3. Form dough into a ball and coat lightly with olive oil. Turn it over in the bowl and cover the bowl with a towel. Let rise until doubled — 1 1/2 to 2 hours. 4. Oil the wells of two muffin tins lightly with olive oil and have them ready. Punch down the dough separate it into four equal pieces with a bench scraper. Keep the rest of the dough covered with a towel while you roll out one of the pieces into a long, thin rectangle (about 12 inches by 18 inches). Brush the dough lightly with olive oil. Cut the dough crossways into 12 equal strips. Stack the strips, oiled side up, into a tall stack. (It is helpful to prop the stack against the rolling pin while doing this!) Cut the stack into 6 pieces. 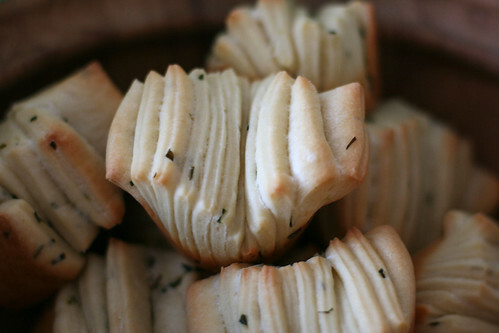 Turn each piece on its side, so the cut layers face up, and place in a prepared muffin cup. Separate the layers slightly so they fan outward. Repeat with the rest of the dough. 5. Cover the muffin tins with a kitchen towel and let the rolls rise in a draft-free place at warm room temperature until doubled and dough fills cups, 1 to 1 1/2 hours. 6. Preheat oven to 350°F. Bake the rolls until barely golden brown, 18 to 20 minutes. Let cool for at least 10 minutes before serving. these are real lookers, amy! i'll bet they're so much fun to make and even more fun to pull apart and eat. bravo!